The Bachelor of Accounting provides a thorough academic grounding in the skills and techniques necessary for entry into the accounting profession. The program incorporates an optional Internship placement year, and offers professional accreditation. The course integrates study of the theory and practice of accounting, and offers significant exemptions from the examinations of professional accountancy bodies. You will be taught by staff who are leading researchers in their fields, some of whom are also qualified accountants. This program is designed to recommend a course of action in an external reporting situation using accounting standards to justify your rationale. It also Propose alternatives in a managerial decision context using cost analysis to support your reasoning. Besides, it evaluate the tax implications of an economic transaction by researching and applying authoritative tax codes. In addition, it assess how business risks relate to risks in internal controls, financial reporting, and/or audit. Moreover, it weighs the ethical, stakeholder, and stewardship implications of an accounting decision. This course is designed primarily for those interested in a career in the accounting profession and will grant you significant exemptions from the professional examinations of accounting bodies. If you successfully complete the Internship placement year, you will gain relevant experience with a high-calibre accounting firm. Our graduates are well-placed to pursue careers in chartered accountancy. An integral part of the course involves building your commercial awareness, confidence and employ ability through workshops with the likes of Accenture and Deloitte. The average income of the graduates of this major are around $10,000--60,000 per year . As the compulsory specialized course, Financial Accounting is based on the basic theory of accounting, focuses on the basic principles of the accounting elements confirmation, measurement, theoretically declare the business processing methods. Financial Accounting is an introductory course designed to help students build a solid foundation of knowledge and skills in preparation for the other courses in financial accounting, as well as other related courses in the accounting curriculum. The broad aims of the course are to provide students with a sound introduction to the general concepts of financial accountingprocedures used in the preparation of financial statementsuse of accounting information in managerial and financial decision- making锛泇arious ethical considerations in accounting. It addresses not only the technical and procedural aspects of preparing external financial statements but also the concepts and principles of the accounting process. Financial Accounting consists of ten parts to be described below. Part 1: An introduction to accounting concepts; Part 2: Recording transactions; Part 3: Adjusting the accounts, preparing the statements, and completing the accounting cycle; Part 4: Accounting for merchandising activities; Part 5: Inventories and special journals; Part 6: Internal control and accounting for cash, temporary investments, and receivables; Part 7: Fixed assets, natural resources, and intangibles; Part 8: Current and long-term liabilities; Part 9: Accounting for partnerships and corporations; Part 10: The cash flow statement and the conceptual framework of accounting. As the compulsory course, Management focuses on methods of continuous and conscious rational allocation of resources and shaping organization. It targets to enterprise's production, marketing, finance, human resources activities and regards plans, organization, coordination, leadership and control as the basic functions. Management research and introduce the basic concept, theory, principle and method of management of enterprise or society. As the important content of modern enterprise management, management exists the whole course of enterprise management. This course revolves around the basic function of management; introduce the basic theory, foundational knowledge and basic skill of management from reality, and analysis the practical problem with case. Student can grasp the basic theory and method of management, current status and tendency of management theory. They also can grasp the related theory and interrelation of plan, organization, leadership and control. Management is beneficial to develop the students' ability of analysis problem, problem-solving skills and improvement of comprehensive management. Management will help students adapt to the increasingly fierce international competition environment. As the compulsory course, Cost Accounting focuses on the expense disbursement in the operation process of enterprises as well as the formation of product cost and the corresponding expenses. Accounting has two big basic functions --- to reflect and supervise. Reflection is cost accounting's most important task, reflecting every expense disbursement, as well as the product manufacturing cost and period expense's formation in the production operation process, providing the cost information for the management. Surveillance is and required implemented through control, adjustment, instruction and the inspection, examining the rationality and the validity of consumption in production operation and achieving the desired cost management. Cost Accounting is involved in cost prediction, planning, calculation, control, inspection and analysis and decision-making by providing the data for cost management. Through the course of the study, accounting students should get a comprehensive, systematic understanding of modern management accounting cost of the basic theory and basic methods, a full understanding of this emerging discipline of accounting to strengthen enterprise management, to improve production and management and to master how to operate in-house analysis, forecast operating decision-making, the development of business plans, implementation of operational control and performance evaluation of the basic knowledge and basic skills with the acquired abilities to analyze and solve problems. As the compulsory course, Adcanced Accounting is a core course for students majoring in Accounting and an optional course for students majoring in CPA, International Accounting and Finance. The objective of this course is to help students understand fundamental theories and practical knowledge of special transactions in financial accounting involved in foreign activities, income tax, non-monetary assets exchange, derivative financial instruments, lease, debt re-construction and liquidation. The aim of this course is to help students develop the following respects: 1.technical and procedural skills required to deal with advanced areas of the GAAP framework established by the International Accounting Standards Board. 2. the ability to apply conceptual principles when selecting appropriate accounting policies in particular circumstances. 3. the ability to assess a situation, identify issues and alternatives, and formulate recommendations using ethical, professional judgment. As the compulsory course, Financial Statement Analysis aims to expound the basic theories and methods of financial statement analysis. It is based on the basic economic theories and the theories of modern management science, and guided by the financial regulations and accounting standards. Financial statement analysis is an applied management discipline that is based on the principle of practicality, focusing on exploring theories, procedures, rules and skills to serve different types of financial statement users. Combined with classic and latest cases both at home and abroad, we are trying to analyze the contents of financial statement, develop students鈥?abilities to discover, analyze and solve problems. Microeconomics, the most important part of western economics, its research object is single economic unit such as single producer, single consumer and single market activity. Microeconomics is the study of one鈥檚 economic behavior who as consumer and producer. It explains which factors influence individual economic choices of various decision-makers operating as individual consumers and producers are coordinated by impersonal marker forces. It is to analyze that how does single producer make maximize profit through distributing the limited resource to various products, and how does single consumer make maximize satisfaction through distributing the limited income to various products. At the same time, Microeconomics also analysis the output, cost, the factors of production, profit of single producer, income of factor supplier, quality, supply volume, demand volume and price of single goods. On the basis of analyzing economic activity of individual economic units, Microeconomics research the market running mechanism of modern economic society and its role in economic resource location, and bring up policy to correct the market failure. esources in the whole world. It mainly includes the microcosmic part which mostly illustrates the basement and police of international trade including trade theory, trade policy and practice, international production elements flow and so on; the macrocosmic part which mostly discusses international finance issues including foreign exchange theory and policy, international income and expenses theory and policy, international currency system etc. compared with international trade, international finance and international business, international economics pays more. Macroeconomics is the study of the economy as a whole, including growth in incomes, changes in the overall level of prices and the unemployment rate. This courseprovides students with basic concepts and techniques needed to analyze economic problems in a variety of contexts. Students will study Economy-wide phenomena, including inflation, unemployment, and economic growth. This course is divided into three parts: Theory of business cycles, Theory of the national incomes, and a Brief Introduction to policies. After successful completion of this course students will be able to demonstrate command of basic and macroeconomic concepts and graphical models, and apply them to new situations. Basic Accounting, which is a fundamental course of accounting education, provides the basic knowledge of accounting for accounting majors. It helps students with their specialized study. By taking this course, students will fully understand the accounting framework and basic principles, and get familiar with the basic methods and basic skills of accounting methods. This course is divided into class teaching and experiment teaching. Class teaching mainly focuses on teaching conceptual framework of accounting basics, basic theories of accounting, practicing the basic practical methods, and learning accounting rules and its systems. Experiment teaching is related to the textbook contents. By taking the experiment of basic accounting skills, it tests whether students have mastered the knowledge of the theories and methods. On the other hand, it helps students to master the procedure of accounting practice and further understand the basic theories, basic principles and basic skills. Financial Management is a fundamental course for the accounting and CPA major, whose major mission is as below: make the students have the comprehensive understanding of the financial management theory and practice; cultivate good habits of in-class discussion and out-class reading & writing; direct the students to think over the problems related to the modern enterprise financial management, so that the students can acquire the knowledge and skills required to be a qualified middle level financial executive. Based on the time value of money and the risk value, the course take the acquisition, investment and distribution of funds as a mainstream锛宔xploring the related theory and practice required to achieve the goal of increasing enterprise value. The course mainly consist of below three parts: Part One is fundamental financial management concept and method, mainly comprise the application of financial statement analysis, financial forecasting skill and financial budget preparation method, measurement of the time value, and the risk value of funds and intrinsic value of assets. Part Two is the core part of financial management, mainly comprise funds acquisition management, investment management, working capital management and profit distribution management. Part Three is the financial management specialized topics, mainly consist of enterprise value assessment and option valuation, exploring the underlying theories, basic methods of option valuation. It also introduces the real option practice. Focusing on the government budget management, Governmental and Not-for-profit Organization Accounting is a specialized accounting that records, reports and monitors the governmental budget and budgetary enforcement by the administrative departments and enterprises. On completion of this course, students should be able to: 1) correctly understand the governmental budget system and governmental accounting policies in China; 2) comprehend the ways that governmental and not-for-profit organization accounting differs from the corporate accounting; 3) grasp the primary theories, methods and techniques, and 4) command the summarizing, reporting techniques and practical skills of governmental and not-for-profit organization accounting. The course aims to help students broaden students鈥?knowledge of financial accounting and lay an essential foundation for financial work in governmental sectors and not-for-profit organizations after graduation. Auditing covers two parts: principles and practices of auditing. The former mainly focuses on the definition and characteristics, the occurrence and development of auditing, the relationship between auditing and accounting, the objectives and content, functions and roles of auditing, organization and positions of auditors, and their ethics and legal liabilities. In this part, the most important definitions and issues include auditing standards, audit evidence, worksheet, audit risk, materiality, auditing reports and so on. The second part focuses on the audit of different cycles, such as sales and revenue, acquisition and payment, production and expenses, finance and investment, monetary items, and auditing reports. This course aims to help students understand the positions and roles auditing plays in modern market economy, understand and grasp the fundamental principles and techniques of auditing, and cultivate their proficiencies in analyzing and stating problems, and participating in actual auditing, which offers a professional basis for future work. SICAS Care Team Members will lead the Chinese undergraduate and graduate students majored in Accounting and Finance Management to act as mentors to help international students get settled down in Jinan and improve their proficiency in Chinese language. Project-based learning using CDIIO concepts is implemented throughout the curriculum. Precisely designed projects help our students to develop real-world problem-solving and communication skills, as well as teamwork spirit. Chu Jinhua, Doctor of Management, professor, is dean of International Business School. He mainly engages in academic research of e-commerce and enterprise informatization and focuses on the basic theories of enterprise e-commerce development. At present, he presides three important provincial programs. He held more than ten provincial programs in the last few years, published more than twenty articles on important journals in China and was granted 3 awards in teaching and academic research. 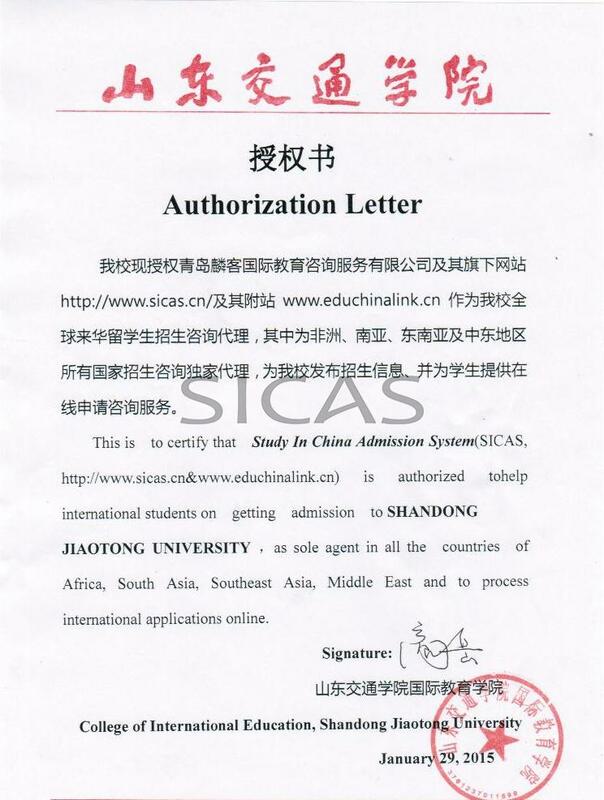 Sun Long, associate professor of Shandong Jiaotong University, is a doctor who study network marketing and sports marketing. He has leaded and participated in more than 10 provincial and city level scientific research projects, publishing more than 30 papers in domestic and foreign journals. He has won many other awards such as the third prize of Excellent Educational Achievements of Traffic, the second prize of Shandong Province Education Outstanding Science Achievements for twice times; The first-class reward, the second-class reward and the third-class reward of Outstanding Achievements of Social Science about Marketing in Shandong Institute; two Provincial Excellent Courses of Marketing and Management; the first prize of Provincial Teaching Achievement. Besides, he has participated in the compilation of four professional marketing teaching materials. Wang Yan, Ph.D. in Economics of South Korea Pai Chai University, has participate in organization and reception of the Northeast Asia Economic Development Conference , Economic Cooperation in Northeast Asia Conference, China and South Korea Economic Ministers Meeting in 2013 and 2014. In September 2013, he published papers and discussed with the participants in the South Korea and China China Business Society Autumn International Academic Conference hosted by Chonbuk National University. In October 2014, he participated in Asia Industrial Technology Conference, involving in the research on market development of China and South Korea. As the researcher of East Asian Institute and member of The Northeast Asia Economic Association of Korea (NAEAK), he has published three Korean core journals. Program commences only if 15 students are enrolled ; otherwise you can study Chinese Language/ Pre- University Program/ other bachelor programs.